Quality workmanship and materials from a licenced Wellington roofing company. Wellington roof repair and re-roofing for residential and commercial properties. We also install scaffold platforms for house painting at the same time as installing your new roof. If you're looking for roofing companies in Wellington that you can trust for new roofs, re-roofing or roof repair, it's Complete Roofing Services. roofers will ensure a top quality job and building code compliance. As we're licenced, this can help with quicker consent sign-off upon completion. 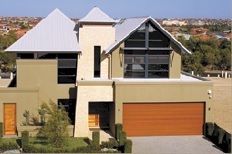 Roof builders with a proven record of customer satisfaction.